← Mr Panman bring me a dream! Eleven fifty four, come in please. Your number is up, but in a good way! 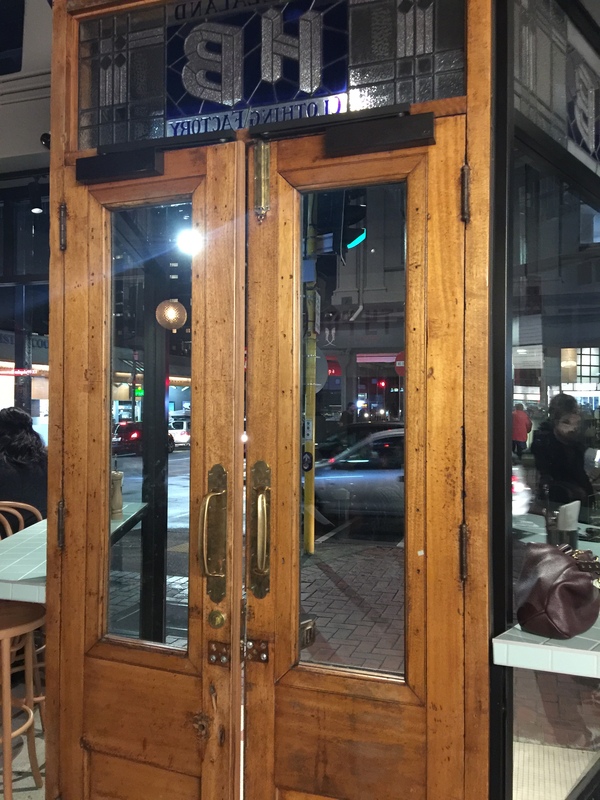 1154 Pasteria is the new hip pasta joint in town that was the former Ernesto’s. 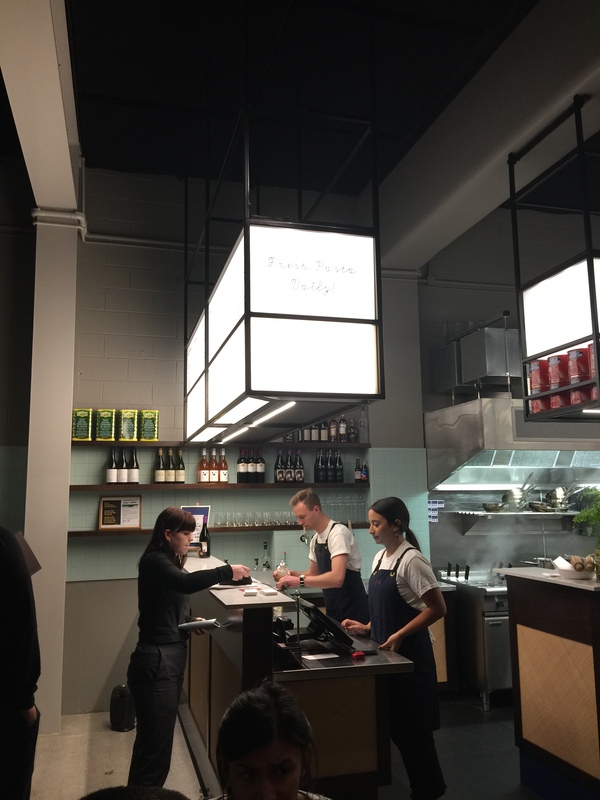 Another brilliant venture created by the Italian-Kiwi Bresolin brothers, who also own Scopa opposite and Bresolin in Willis Street.Girlfriend Libby asked me for a date here even before it had opened. I laughed as I drove past, as the windows were still covered in brown paper. 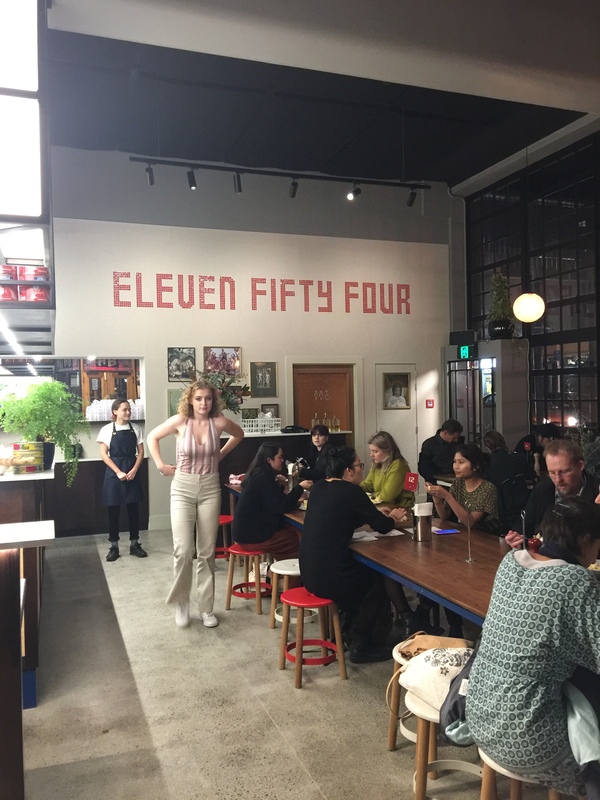 However the paper was whipped off in a jiffy and boom the Wellingtonian foodies flocked here since the opening. 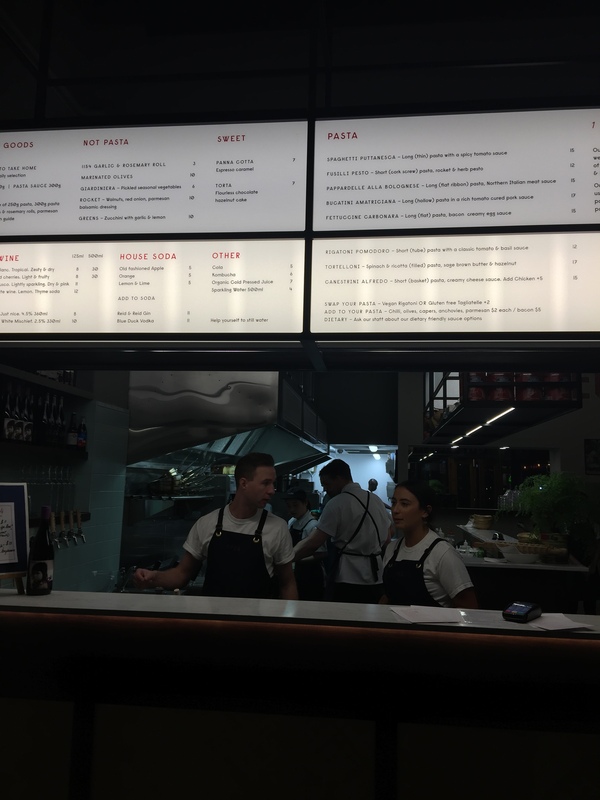 Price-wise it targets the students, so around $14-$17 for a pasta with wines by the glass with equally cheap sides. It’s casual, walk-in with a communal share policy. Nabbing stools by the window while you people watch is so European and fun. You need to order at the counter as there is no service, apart from meal delivery. 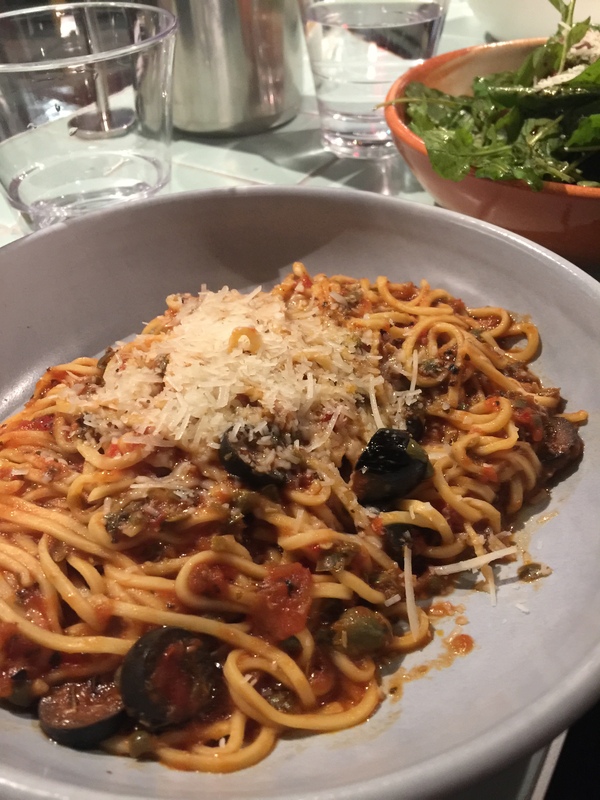 Local ingredients are sourced, including free-range eggs, semolina and only the best parmesan- Grano Padano. They combine these, from scratch, to deliver the best possible version of a classic pasta dish. Their dietary chart targets the hipster V, vege, GF and DF peeps as well as the normal peeps too. So choose your sauce e.g. 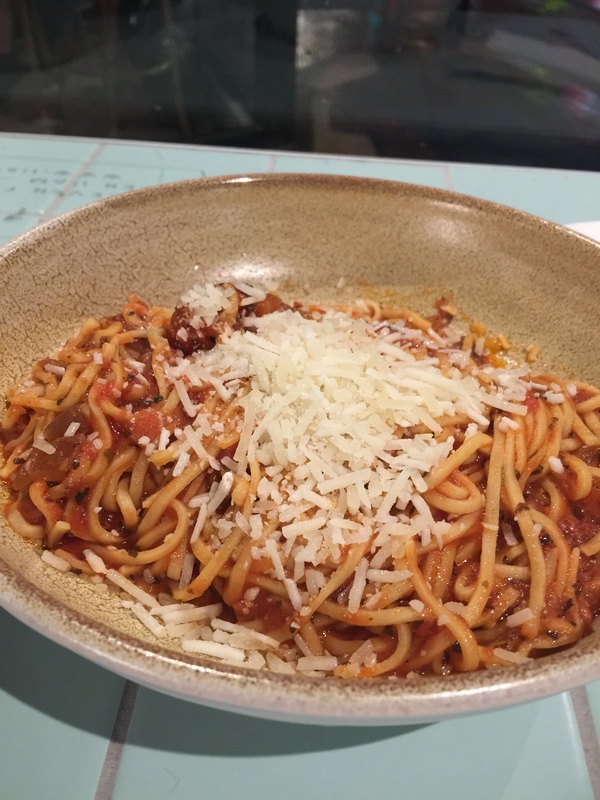 puttanesca, bolognese, alfredo, pomodoro, carbonara, amatriciana, rocket/herb with your type of pasta e.g. spaghetti, fusilli, bucatini, penne, tortelloni, ganestrini and you’re away laughing. There are add-ons such as chillis, olives, capers, parmesan or bacon for $2 each. 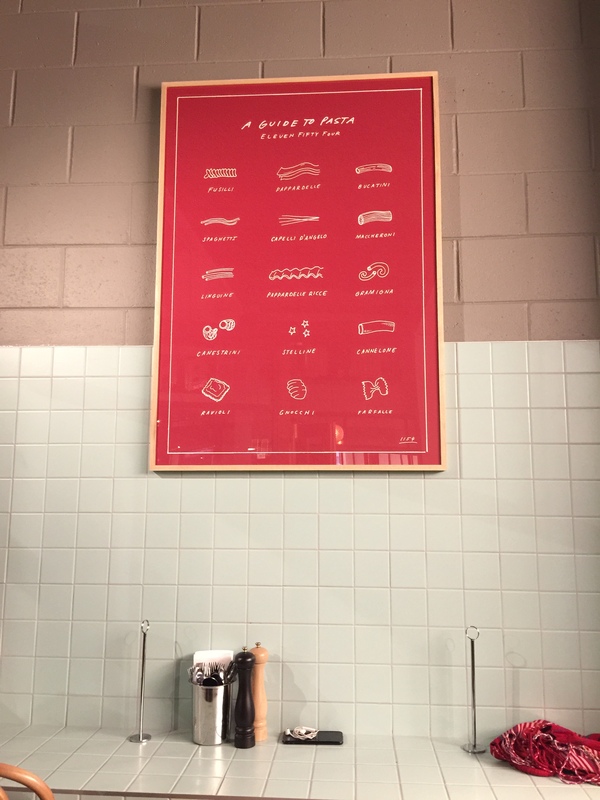 And you can also order a garlic roll, olives, or giardiniera (fermented crudities). I’ve only eaten dried GF spaghetti or penne, so initially was a little disappointed the only two choices were vegan or tagliatelle pasta. However the tagliatelle had to be the best, fresh GF pasta ever. Libby’s puttanesca rated just slightly higher than my amatriciana as far as taste, but both were fabulous. Puttanesca is an intriguingly, derogatory- named pasta sauce. It’s derived from Naples and refers to the Italian ‘Ladies’ of the night. The word itself is often shortened to pute, putain or putta and used by the French and Spanish.. Google for more precise definitions! It is known as the poor man’s pasta where being short on money and time, which go together in this reference, they grabbed everything from the cupboard e.g. capers, olives, garlic, tomatoes, red pepper flakes, to make a quick delicious vegetarian sauce in between business. 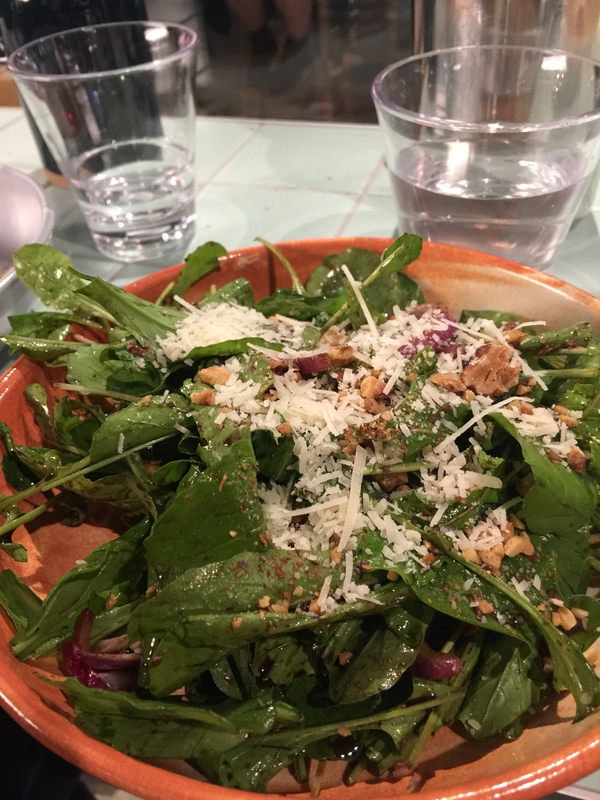 We ordered a side of rocket salad to share, which was yummy with walnuts, balsamic although a little too much red onion. Next time I’d like to try the zucchini with garlic and lemon. I normally love a glass of red with my pasta, but we both didn’t feel like drinking, so we were happy with water. I’ll definitely try a spritzer or a sangiovese next time, and I’d love to see an aperol spritz or Campari offered in summer. They have a couple of beers, juice, cola, gin, vodka and good ole kombucha. Desserts are either an espresso caramel or -panna cotta – simple but we were too full so will leave for our next visit. Ti amo e ci vediamo presto 1154.